You are here: Home / VotePGH / Will you pledge to vote on May 21? Will you pledge to vote on May 21? Two weeks from today, May 21, is primary election day in the city of Pittsburgh (and the state of Pennsylvania). This is a big election for the city of Pittsburgh as voters will select who will be the democratic nominee and likely the winner of the general election in November. Pittsburgh has not had an independent or republican mayor since 1998 (you can see the entire list of Pittsburgh mayors on wikipedia here). 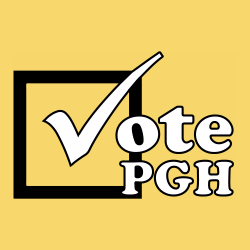 In an effort to increase voter participation in the upcoming election we have created votePGH. Please take a moment to visit votePGH.org and pledge to vote on Tuesday, May 21, 2013. This is a non-partisan effort to increase awareness about the upcoming election. We have set a goal of collecting 1000 pledges by May 21 – we need you to take the pledge and invite your friends to do the same. Keep reading below for more information on voting in Pittsburgh and why a voter pledge. A huge thanks to Emile Goss and Kate Holloway who volunteered their time and skill to make votePGH look awesome. So if we take the highest number here – 68,000 in 2007 when the population of the city of Pittsburgh was about 312,000 people – only about 20% of the people who live in the city of Pittsburgh are participating in the decision of who will lead this city. So how do we get more Pittsburgher’s to vote? The organization Nonprofit Vote, which works with nonprofit organizations to help them engage their members in the election process, has started doing some research on how to increase participation. Studies have shown, and more research is underway, that people who are contacted about voting before an election are more likely to vote and more likely to encourage friends and colleagues to vote on election day. You can read more about Nonprofit Vote’s research here.